Need a inexpensive Crystal Reports reader to view your Crystal Reports and refresh their data? Try the cView Crystal Reports viewer or products for viewing Crystal Reports on the web. Crystal Reports provides comprehensive functionality to design, explore, visualize, and deliver compelling reports. Xcelsius integration � Visualize the potential outcome of your business decisions with what-if scenario models built in your report file. Import Xcelsius-generated SWF files into your report and benefit from improved design-time integration. IT and developers will design fewer reports to support the decision making process. Please note: Xcelsius design tool is not included in Crystal Reports 2008. Adobe Flex integration � Execute business decisions from within the report file. Integrate your reports with operational workflows by embedding Adobe Flex (SWF) applications into your reports. Using Adobe Flex Builder you can create any business user UI to access report data and integrate with external Web services. Data in your report can be passed to the Flex application via Flashvars, making it easy to create a flexible UI even when you don't have access to your data via Web services. The Flex applications enable you to perform tasks such as database write-back � invoking operational workflows directly within Crystal Reports. IT and developers benefit from instant, coding-free integration of Crystal Reports with your business processes. Please note: Adobe Flex Builder is not included in Crystal Reports 2008. Parameter panel � The report designer and the .NET Winform and .NET Webform viewers have a parameter panel that allows you to set parameter values without refreshing data. The parameters are displayed directly on the panel, so you can easily see them, make changes, and have new values applied directly to the saved data. Interactive report viewing � Users can answer more business questions with fewer -and more flexible � reports, significantly reducing dependency on developer and IT support. On-report sorting, filtering, and report reformatting with the .NET Winform and .NET Webform viewers allows users to explore information interactively without re-querying the database. New optional parameters provide for complex user-driven filtering scenarios. Flash integration � Create stunning visualizations by adding dynamic charts, graphics and even video files to your reports. A wide variety of flexible data presentation options are available through Flash. Flash (SWF) files can be integrated into your report and report data can be shared with SWF via Flashvars for compelling, interactive, and information-rich reports. Plus, the SWF files can quickly be embedded in the report or linked via a Web site, saving IT and development time. Powerful crosstabs � Create stunning visualizations by adding dynamic charts, graphics and even video files to your reports. A wide variety of flexible data presentation options are available through Flash. Flash (SWF) files can be integrated into your report and report data can be shared with SWF via Flashvars for compelling, interactive, and information-rich reports. Plus, the SWF files can quickly be embedded in the report or linked via a Web site, saving IT and development time. Flexible pagination � Facilitate better online report viewing to your end users. Report designers can customize page size and easily control page breaking after N records/groups. A single report can combine portrait- and landscape-oriented pages and the white space at the end of groups can be removed by compressing the page footers. So your users can benefit from easier-to-read reports. Xcelsius, Adobe Flex, and Adobe Flash integration � Crystal Reports developers can produce powerful mashups pulling data from various sources. Your developers can easily integrate components designed in Flash and Flex without any coding, and significantly expand the scope of their application deployment. Please note: Access to commercial third party Flash components like ESRI ArcWeb Services as shown in the demonstration is not included in Crystal Reports 2008. Enhanced Web services data driver � Expand your access to data over the Web. The new data driver offers additional Web access to Web services by providing support for RPC encoding of SOAP messages, SSL-secured Web servers, as well as a working compatibility with the WS-Security standard. It adapts to custom logon requirements such as e-mail addresses or user/password. Developers can combine the flexibility of XML and Web services with report formatting and visualization to deliver reports linking report data to sophisticated interactive data mashups such as integration with third-party mapping systems. Built-in barcode support � Save design time and reduce your cost. Generate barcodes with only a few clicks of the mouse by using the new 'turn to barcode' function in the context menu. Easily convert fields to Code39 barcodes without any coding or extra steps. And benefit from additional barcode fonts available from third-party vendors. Enhanced designer features � Report designer will be more productive with features like global formula search, duplicate formula, duplicate running total, auto complete field names, and the 'find in field explorer' feature. 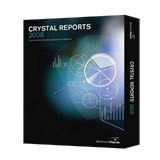 Single edition � Crystal Reports 2008 comes in a single edition that is the feature equivalent of the previous Developer Edition. This single offering provides customers with quick access to the features they need to meet any application and user requirement. Report samples and developer documentation now come in a free, optional download. Multilingual reporting � Choose the working language you prefer by simply selecting the language packs you wish to use during your Crystal Reports installation. Then switch the report designer UI to use any of the installed language packs. The report content locale can also be explicitly set for each report file. This setting controls sorting, grouping, and formatting that matches the local language customs and conventions. Reduced install footprint � The download size has been reduced to 300MB to provide fast access via the download site. The runtime files included in developer applications are also significantly smaller. Hyperlinking wizard � Report designers can save time by automatically creating the Crystal Reports formula required to invoke an SAP BusinessObjects Enterprise 'opendocument' hyperlink. Save reports directly to crystalreports.com � Expand your deployment options with on-demand reporting capabilities when you open and save reports directly to crystalreports.com. This new integration allows you to manage and share your reports securely without depending on IT support. Integrated salesforce.com driver � The salesforce.com driver included with Crystal Reports 2008 allows for easy access to complete customer data � turning it into actionable business information. Reports that use a salesforce.com driver will refresh when deployed to crystalreports.com. NET report modification SDK � The report application server SDK is now available for users of CR.NET API without the use of an RAS server. You can perform report modifications, including changing, adding, and removing database providers; adding, removing, and creating report objects; parameters; formulas; and sections by accessing the RAS SDK through the CR .NET SDK. Advanced report publishing � With Crystal Reports, you can leverage a platform for the mass distribution of personalized content. Create multiple reports based on different data sources, combined into one desired file format (such as PDF), loaded with personalized content, and then sent to a dynamic list of recipients � all with a single action. The content can be archived, printed, or e-mailed in separate actions, or simultaneously. This makes scheduling much faster and easier, and offers you the ability to conduct cost effective one-on-one marketing campaigns and other personalized, high-volume reporting.